Do whatever you want with that. 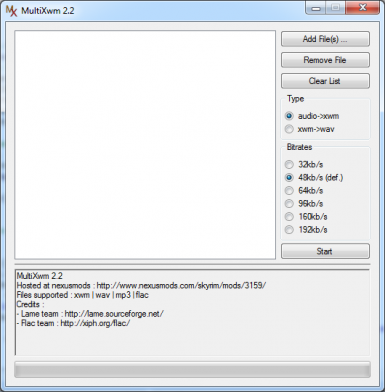 This program lets you convert multiples WAV and MP3 files into XWM files in one go. I saw in the forum that some people requested something like that, there's a batch out but I just went with it. The converted files are in the /output folder. Files types supported : xwm, wav, mp3, flac. ogg will come eventually. Windows only, also please guys, extract the zip before running the program. 2014-08-18 : As I don't really have the time to update this anymore, I've released the source files for 2.3. It's kind of a mess of a code, but if anyone wants to take a shot a it, just do it! You can assume 2.3 as the final release from me and it most likely won't be updated anymore. v2.0 : ported code to c# and fixed bugs, it should work correctly now, errors messages should be more to the point too. You might need .NET runtimes to run it. - It doesn't support utf8 named files or paths. That include japanese, chinese, russian, arabic characters (and a whole bunch of other). Rename your files to latin characters before converting them and put the program in a folder where there aren't any utf8 characters too (like in C:multixwm). I'll get around to fix that eventually.